I took these pics in Saskatoon during the annual Cruising Weekend. It was raining so I didn't get many pictures. Oh yeah, and all of these exotics are owned by ONE local resident. What Cars Still Come with Ashtrays? I was recently in a C6 Corvette and noticed that the car comes with an ashtray built into the center console. I don't recall seeing an ashtray in a newer car for many years now. Any other cars still come with an ashtray? Niky Nine has a new single and the video is made of old car commercials (again). The sound is a bit brighter than other outrun music previously posted but it's still rocking! Available for FREE on Niky Nine's bandcamp page. For the second year in a row the ST is still wearing it's winter boots until May. I took this picture last week. At least I got a new grill and diffuser out of the deal. Tonight's Oppo Outrun features two songs inspired by iconic 80's cars: "Sierra" and "Quattro" both by Hugo Rancho. 1986 Skoda for Sale. Will it Hoon? Can anyone tell me anything about this car? I know nothing about these and I am having a hard time finding much info on them. But what I really want to know is, how hoonable is this car? It's RWD with it's engine is in the back, so I'm assuming quite. Preview for the movie "Kung Fury". This movie has it all: over the top car stunts, kung-fu, Nazis, and a viking with an uzi. It also features a great soundtrack by Mitch Murder and The Lost Years. It's almost impossible to watch without exclaiming "WTF?!" Finally put my stickers on the car. 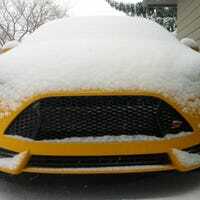 Oh, and a ST in the snow = oversteer. Oppo in a fwd at 15km/h. A lot of fun! I Want to Buy this V70 T5. Please Talk me Out of It! I came across this Volvo V70 T5 that is a total loss. It appears the vehicle needs a new rear windshield, has some hail damage, and a scrapped rear bumper. Pretty minor damage, and mighty tempting at a $500 opening bid.